Miss Marie Ryan, of 128 Market street, returned to her home yesterday from Memorial Hospital, where she was admitted October 19 for medical treatment. Miss Rayn, a graduate nurse, is reported in a much improved condition. Admitted to Memorial Hospital at 5:15 o'clock last evening, David Dunlap, 23, of 1230 Solomon road, underwent an emergency operation for acute appendicitis. His condition was pronounced fair today. Clifford Evans, of 107 Dibert street, was discharged yesterday from Memorial Hospital, where he underwent an operation following his admittance on January 24. Royal Heckley, 27, of 565 Coleman avenue, is reported to be gradually recovering in Memorial Hospital from a serious operation last Saturday. Bernhardt Meyer, of Pine street, well-known musician, is said to be holding his own at Memorial Hospital, where he was admitted in a serious condition one week ago tonight. Charlotte Morrison, seve, who sustained a fracture of the skull in a coasting accident on January 27, has been removed from Memorial Hospital to the home of her parents, Mr. and Mrs. Ralph W. Morrison, Boswell. Continued slight improvement was reported today at Mercy Hospital in the condition of Miss Margaret Wills, of Ebensburg, who is suffering of a fracture of the skull received in a coasting accident Monday evening. Miss Wills is yet in critical condition, it was emphasized. Mike Evin, 135 D street; George Slachta, Johnstown R. D., and Steve Kuzer, Fifth avenue, Cambria City, thre [sic] Cambria plant employees injured in an accident Wednesday, were reported in an improved condition today in Cambria Hospital. 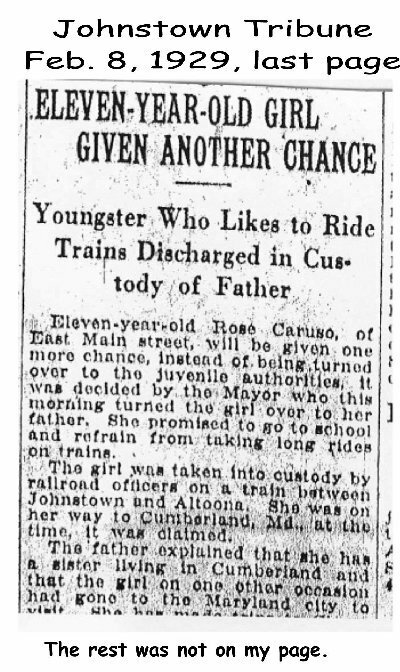 Eleven-year-old Rose Caruso, of East Main street, will be given one more chance, instead of being turned over to the juvenile authorities, it was decided by the Mayor who this moring turned the girl over to her father. She promised to go to school and refrain from taking long rides on trains. The girl was taken into custody by railroad officers on a train between Johnstown and Altoona. She was on her way to Cumberland, Md., at the time, it was claimed. Her clothes igniting when she pulled a hot poker from the stove, Charlotte Gillespie, five-year-old daughter of Mr. and Mrs. Andrew Gillespie, of 2229 First street, East Conemaugh, is a patient in Lee Homeopathic Hospital with severe burns of the face, both arms and absomen. The burns are described as being of second- degree severity, according to the hospital report today the child's condition fair. 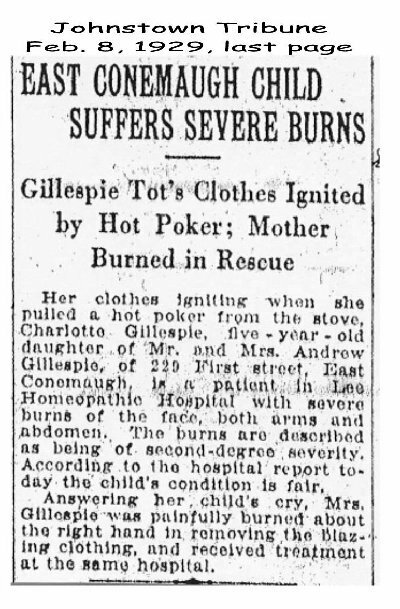 Answering her child's cry, Mrs. Gillespie was painfully burned about the right hand in removing the blazing clothing, and received treatment at the same hospital. 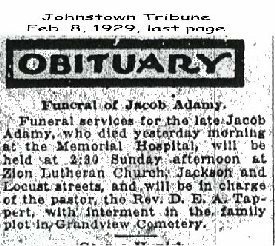 Funeral services for the late Jacob Adamy, who died yesterday morning at the Memorial Hospital, will be held at 2:30 Sunday afternoon at Zion Lutheran Church, Jackson and Locust streets, and will be in charge of the pastor, the Rev. D. E. A. Tappert, with interment in the family plot in Grandview Cemetery. Mrs. Ella Fender, wife of George W. Fender, a former Johnstowner, died at her home, 3216 Universal avenue, Pittsburg, early yesterday morning. Her death was due to pleuro-pneumonia. Mrs. Fender was a daughter of the late Mr. and Mrs. John Birch and was born and lived all her life in Pittsburg. Funeral services will be held at the Fender home on Sunday afternoon with burial at Parnassus, Pa. 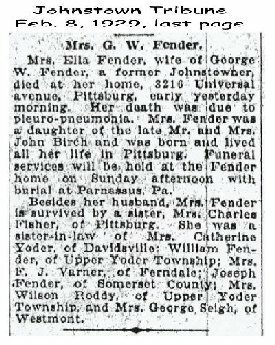 Besides her husband, Mrs. Fender is survived by a sister, Mrs. Charles Fisher, of Pittsburg. She was a sister-in-law of Mrs. Catherine Yoder, of Davidsville; William Fender, of Upper Yoder Township; Mrs. F. J. Varner of Ferndale; Joseph Fender, of Somerset County; Mrs. Wilson Roddy, of Upper Yoder Township, and Mrs. George Seigh, of Westmont. 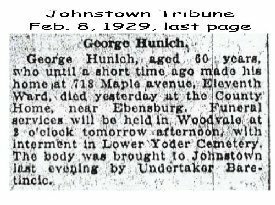 George Hunich, aged 60 years, who until a short time ago made his home at 718 Maple avenue, Eleventh Ward, died yesterday at the County Home, near Ebensburg. Funeral services will be held in Woodvale at 3 o'clock ktomorrow afternoon, with interment in Lower Yoder Cemetery. The body was brought to Johnstown last evening by Undertaker Baretincic. Mrs. Walden E. Rorabaugh, of 211 Worth street, Eighth Ward, died this morning at 8:25 o'clock at Mercy Hospital, where she had been a patient since February 1. Her death was due to a complication of diseases. Mrs. Rorabaugh was in her 42d year. She was a communicant at the First Lutheran Church, whose minister, the Rev. Dr. Henry W. Snyder, will have charge of the funeral services at the Rorabaugh residence at 2:30 o'clock Sunday afternoon, with interment in Grandview Cemetery. Mrs. Rorabaugh before her marriage was Miss Minnie Mabel Koontz. She was a daughter of Frank and Elizabeth (Slick) Koontz and was born in the Eighth Ward, February 25, 1887. Her parents survive her with five sisters, Mrs. Charles Diehl and Mrs. E. D. Jones, of Moxham; Mrs. F. W. Davis, of the Eighth Ward; Mrs. H. L. Heuser, of Cleveland, O., and Miss Beulah Koontz, Secretary to Prof. James Killius, Principal of the Johnstown High School. Miss Minnie Koontz and Mr. Rorabaugh were married at the First Lutheran Church in November, 1924, by the Rev. Dr. Snyder. Mr. Rorabaugh survives her. The deceased was confirmed in the First Lutheran Church during the pastorate of the Rev. Dr. William Alfred Shipman. She was educated in the Johnstown schools, graduating with high honors in the commercial department in the class of 1907. She was an expert stonographer and was employed in the office of the Solicitor of the Cambria Steel Company for about 15 years. 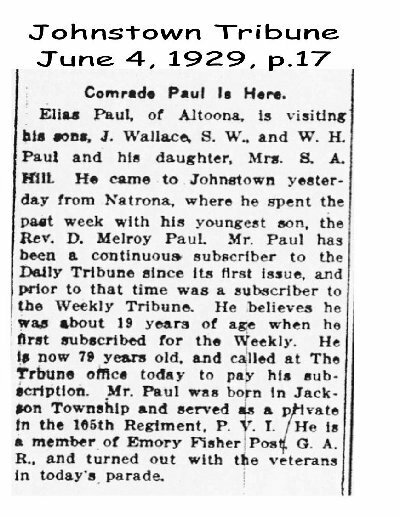 Elias Paul, of Altoona, is visiting his sons, J. Wallace, S. W., and W. H. Paul and his daughter, Mrs. S. A. Hill. He came to Johnstown yesterday from Natrona, where he spent the past week with his youngest son, the Rev. D. Melroy Paul. Mr. Paul has been a continuous subscriber to the Daily Tribune since its first issue, and prior to that time was a subscriber to the Weekly Tribune. He believes he was about 19 years of age when he first subscribed for the weekly. He is now 79 years old, and called at The Trbune (sic) office today to pay his subscription. Mr. Paul was born in Jackson township and served as a private in the 105th Regiment, P. V. I. He is a member of Emory Fisher Post, G. A. R., and turned out with the veterans in today's parade. 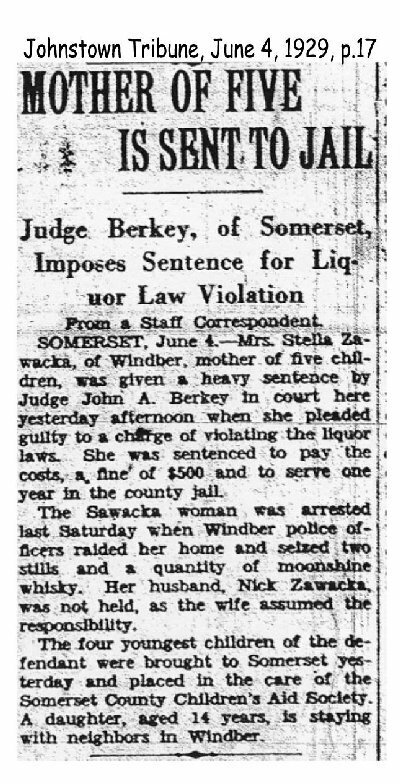 SOMERSET, June 4.-- Mrs. Stella Zawacka, of Windber, mother of five children, was given a heavy sentence by Judge John A. Berkey in court here yesterday afternoon when she pleaded guilty to a charge of violating the liquor laws. She was sentenced to pay the costs, a fine of $500 and to serve one year in county jail. The Sawacka (sic) woman was arrested last Saturday when Windber police officers raided her home and seized two stills and a quantity of moonshine whisky. Her husband, Nick Zawacka, was not held, as the wife assumed the responsibility. The four youngest children of the defendant were brought to Somerset yesterday and placed in the care of the Somerset County Children's Aid Society. A daughter, aged 14 years, is staying with neighbors in Windber. By United Press, MOSCOW, June 21. -- John D. Rockefeller III, who graduated this month from an American university, is expected to visit the Soviet Union the middle of July accompanied by James MacDonald, Chairman of the American Foreign Policy Association. The Rev. Dr. W. K. Anderson, pastor of the Franklin-street Methodist Episcopal Church, returned to the city at noon today from Chicago, Ill., where he was in attendance yesterday at a meeting of the Commission on worship and Music of the Methodsit Episcopal Church. Dr. Anderson is a member of the Commission, which was reported to have made excellent progress in launching its work. Comprising the Commission are five laymen, representing widely scattered sections of the county. George T. Robinson, of Westmont who was seriously injured in an automobile collision on the Lincoln Highway between Everett and Bedford on May 23, was brought to Johnstown yesterday afternoon from Bedford by Mrs. Robinson and Mr. and Mrs. Earle B. Robinson, son and daughter-in-law of the patient. Mr. Robinson had been at Timmens Hospital, Bedford, since the accident. He is now at his residence 143 Greene street. The patient is slowly improving. PITTSBURG, July 5. 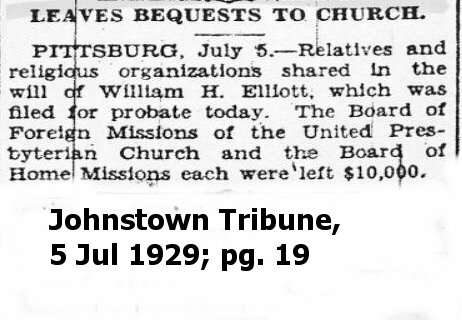 -- Relatives and religious organizations shared in the will of William H. Elliott, which was filed for probate today. The Board of Foreign Missions of the United Presbyterian Church and the Board of Home Missions each were left $10,000. WINDBER, July 5.-- Richard Stefanko, nine-year-old son of Mr. and Mrs. John S. Stefanko, of vail avenue, had one of his hands painfully burned Wednesday seening when he applied a match to some powder while putting off firecrackers. Chain Snaps and Chassis Falls on Garage Employees; Youth in Hospital. Homer Warnick, aged 20, of Jenners, is in Memorial Hospital, suffering of an injury to the back, and two other men, one of them Warnick's meployer, were less seriously injured late Wednesday afternoon when a chain breaking resulted in a motor truck chassis falling on them as it was being unloaded from a box car in the B. & O. siding at Boswell. Warnick, a son of Mr. and Mrs. M. C. Warnick, is an employee of R. Clyde Vincent, who conducts a garage at Jerome. Wincent was being assisted by Warnick and a second employee, Foster Thaomas, also of Jerome, in the unloading of a consignment of three automobiles and one truck. The automobiles had been removed when the chain snapped, the rear end of the chassis knocking the men to the floor and pinning Warnick beneath the frame. The other men were hurled to the side. Mr. Vincent suffered a puncture of the side from bolts on the tire carrier and was bruised. Thomas, who was steering in the operation of lowering the car, suffered a sprain and bruises of the right leg, having a narrow escape from having his leg broken, it was reported. Warnick was brought to Memorial Hospital at 8:30 p.m. and was reported in a fair condition today. SOMERSET, July 5. 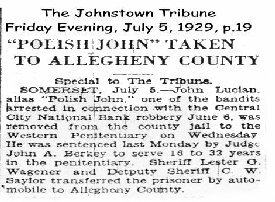 -- John Lucian, alias "Polish John," one of the bandits arrested in connection with the Central City National Bank robbery June 6, was removed from the county jail to the Western Penitentiary on Wednesday. He was sentenced last Monday by Judge John A. Berkey to serve 16 to 32 years in the penitentiary. Sheriff Lester G. Wagener and Deputy Sheriff C. W. Saylor transferred the prisoner by automobile to Allegheny County. WILLIAM E. HINKEL, of Pittsburg, spent the Fourth with his parents, Mr. and Mrs. William Hinkel, of 320 Luzerne street. MISS MADGE BODEN, of Napoleon street, is home from Shamokin, where she was the quest of relatives for several weeks. MISS BELLA COLL, of Westmont, spent yesterday at Seton Hill College, Greensburg, visiting her relative, Sister M. Irene. MRS. JOHN E. JONES, of Bellevue, Pittsburg, has returned home after a visit to the Campbell Rutledge family, of Plainfield, Eighth Ward. MR. AND MRS. EMMETT MERSHALL, of Clairton, Pa., former residents of Westmont, spent the holiday among relatives here. MR. AND MRS. JEROME HUDSON and two children, of Orchard way, left Wednesday for Atlantic City, where they will spend their vacation. CHARLES A. B. HEINZE, of Moxham, returned yesterday to State College, where he is employed for the summers, after a brief visit with his family. MR. AND MRS. PIUS WILL and their little daughter, of Union street, First Ward, have gone to Ogletown, Somerset County, to spend a few days camping out in that vicinity. WILLIAM McDONOUGH and his sister, Mrs. James Connell, of Cleveland, were recent visitors at the home of their cousin, John Hasenstab, of Strauss avenue. MISS VERNA KUNKLE, of 381 Moore street, a local teacher in the public schools, has gone to Detroit, Mich., to spend two months visiting friends and relatives. MR. AND MRS. CDHARLES DELTRY and their daughter, Irene Deltry, of New York City, are visiting Mrs. Mary Mahalick, of Nettleton, this county. CAMPBELL MOSES, OF Swissvale, was here over the fourth with his mother, Mrs. Willis Moses, of the South Side. Campbell Moses is a former resident of this city. MR. AND MRS. HOWARD E. WHITE and family, of Alexandria, Pa., are visiting in Westmont with Mrs. white's parents, Mr. and Mrs. John H. James, of 121 Clarion street. CAPT. JOHN RODGERS, of Fort Benning, Ga., is visiting his brother, Harry T. Rodgers, of Westmont, and other relatives. Captian Rodgers will go from here to Drexel Institute, Philadelphia. MRS. HARRY A. GEER, and her son, Phiulip Geer of 1063 Franklin street, have gone to Coral Gables, Fla., to remain for some time with Mrs. Allison Curry, sister of Mrs. Geer. The Curry family formerly resided in Johnstown. CHRIS STOCK, Paul Stock, Charles Stock and Mrs. Charles stock, of Butler, Pa., have returned home after spending a few days with friends here. They also attended the Cambria County Exposition at the Ebensburg fair Grounds. MRS. JAMES J. ZIMMERMAN, of Greensburg, is at the home of her mother, Mr.s Anna Gould, of the Gould apartments, Franklin street, where she is recuperating. She had been a patient at the Windber Hospital following an operation for appendicitis. RICHARD MANSFIED, son of Mr. and Mrs. Frank M. Mansfield, of Ferndale, had been assigned to temporary duty as a simplex operator at the local Western Union office. He had been located in various offices of the company in this State for a number of months. MR. AND MRS. ROBERT ROBISON McDOWELL and daughter Dorothy, of 770 Linden avenue, Moxham, are on a motor trip to the State of New York. They are at Niagara falls as the guests of the Herbert Latta family, their relatives, and will visit friends in Buffalo before returning home. MR. AND MRS. THOMAS MAHER, of this city, who were married recently at St. John's Catholic Church, are visiting Mr. and Mrs. Whitney Holmes and MR. and Mrs. Carl B. Coogan, of Philadelphia. Mrs. Holmes is a sister of Mrs. Maher and Mrs. Coogan. MR. AND MRS. LEWIS C. FLICK, of Johnstown, were guests at the home of the latter's parents, Mr. and Mrs. H. D. Shirey, of Deeds street, from Saturday to Sunday. Archie Stouffer, on of our local boys employed at Johnstown, spent last Friday at the home of his parents, Mr. and Mrs. Harry Stouffer, of West Main street.---Ligonier American. Stone in Grandview Erected to Memory of Rev. Strombom to Be Unveiled Sunday. SOUTH FORK, Aug. 3. -- Mrs. Barbara Gramling, relict of Charles Gramling, who resides with her daughter-in- law, Mrs. Elizabeth Gramling, 430 Lake street, this place, today is observing her 96 birthday anniversary and is probably as remarkable a lady of her age as is to be found anywhere. Although hard of hearing, her mental faculties are as bright as ever, as may be judged from the cut made from a photograph taken only four years ago. Mrs. Gramling is a daughter of Martin and Margaret (Speicher) Stull and was born near the present town of Elton. She was a sister of William Stull, Joseph Stull, a Civil War veteran, who died at Summerhill a few years age, and John Stull, who was killed during the Civil War. In early life she married Charles Gramling, who was shot through one of his hips in the war and died when about 39 years of age, some time after the war but probably to some extent, at least, of the effects of the wound. Mrs. Gramling had two children, Emanuel G. and Lydia, the latter of whom died young. Emanuel Gramling married Elizabeth Strayer and of their children Charles D. Gramling is postmaster at South Fork; Ella married R. L. Miller and is now deceased, leaving one child Robert A., and Sarah, who married Albert Retallack, of Ebensburg, and has four children--Dale, Meade, Hazel and Junior. Children of Mr. and Mrs. C. D. Gramling are Charles and Byron. 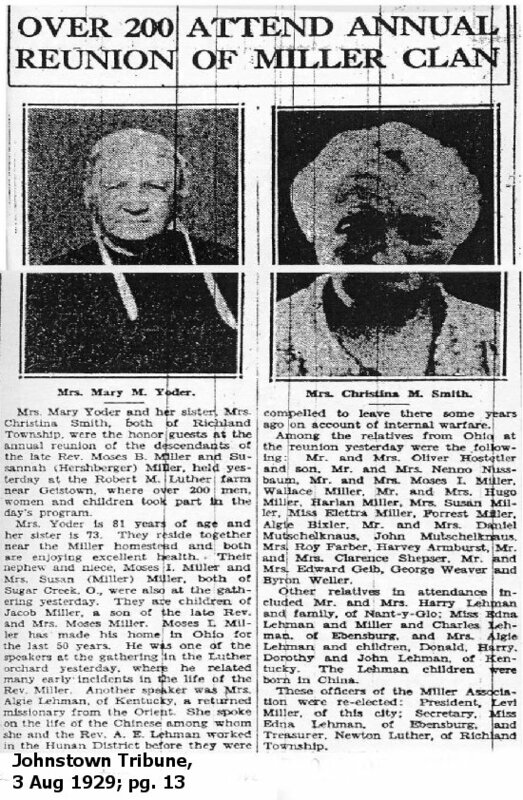 Mrs. Miller died in 1928 leaving an adopted son, Robert A. Miller, who is a doctor located at Sandusky, O. Larue Miller, and engineer on the South Fork- Windber branch railroad, also survives. Mrs. Gramling moved to South Fork in 1890. She has been a lifelong member of the Evangelical Church. Emanuel Gramling died about 20 years ago. Mrs. Barbara Gramling lived on a farm near the Reservoir when it broke July 16, 1862, and also on May 31, 1889, the occasion of the Johnstown Flood, moving to South Fork in 1890. Emanuel Gramling lived at Gramlington and ran a general store there prior to the Flood; then in the spring of 1890 he moved to South Fork and was in business there up to the time of his death, which occurred on April 9, 1909. The great-great-grandchild of Mrs. Gramling is Vivian C. Gramling, daughter of Charles E. E. (sic) Gramling, a merchant of South Fork. Members of the Walnut Grove Church of the Brethren on Tuesday will hold an elaborately arranged gathering at the church. It is planned as a testimonial to the pastor, the Rev. G. K. Walker, and his family, who will leave shortly to take a pastorate at La Verne, Cal., and also for the Rev. and Mrs. Glenn Norris, who will sail next week for Sweden as missionaries. Mrs. Norris, who was formerly Miss Lois Det....(next line or two missing) a member of Walnut Grove Church until a few years ago, and will be supported in the missionary field by the Walnut Grove church. The Rev. H. B. Heisey and family, of Morrellville, who will travel to the west coast with the Walker family will also be guests of the Walnut Grove church on Tuesday evening, as will Dr. and Mrs. J. M. Blough, missionaries to India, who are on a furlough now and will sail to India again very soon. The meeting will begin at 1:15 o'clock with a luncheon served in the basement of the church by the Social Committee, of which Mrs. A. J. Strayer is Chairman. The Sunday School Orchestra will play at the time and the Rev. Heisey will speak. At 8 o'clock the meeting in the main auditorium will begin with devotions in charge of Mrs. J. M. Blough. Dr. J. M. Blough, Mrs. Glenn Norris and the Rev. G. K. Walker will be speakers at the meeting, and the Rev. George L. Detweiler will sing. 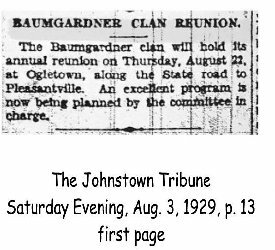 The Baumgardner clan will hold its annual reunion on Thursday, August 22, at Ogletown, along the state road to Pleasantville. An excellent program is now being planned by the committee in charge. 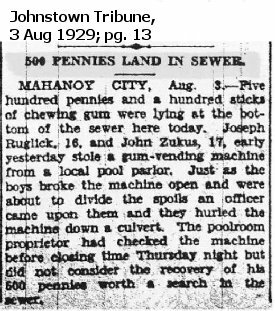 MAHANOY CITY, Aug. 3.- Five hundred pennies and a hundred sticks of chewing gum were lying at the bottom of the sewer here today. Joseph RUGLICK, 16, and John ZUKUS, 17, early yesterday stole a gum-vending machine from a local pool parlor. Just as the boys broke the machine open and were about to divide the spoils an officer came upon them and they hurled the machine down a culvert. The poolroom proprietor had checked the machine before closing time Thursday night but did not consider the recovery of his 500 pennies worth a search in the sewer. Mrs. Mary Yoder and her sister, Mrs. Christina Smith, both of Richland Township, were the honor guests at the annual reunion of the descendants of the late Rev. Moses B. Miller, held yesterday at the Robert M. Luther farm near Geistown, where over 200 men, women and children took part in the day's program. Mrs. Yoder is 81 years of age and her sister is 73. They reside together near the Miller homestead and both are enjoying excellent health. Their nephew and niece, Moses I. Miller and Mrs. Susan (Miller) Miller, both of Sugar Creek, O., were also at the gathering yesterday. They are children of Jacob Miller, a son of the late Rev. and Mrs. Moses Miller. Moses I. Miller had made his home in Ohio for the last 50 years. He was one of the speakers at the gathering in the Luther orchard yesterday, where he related many early incidents in the life of the Rev. Miller. Another speaker was Mrs. Algie Lehman, of Kentucky, a returned missionary form the Orient. She spoke on the life of the Chinese among whom she and the Rev. A. E. Lehman worked in the Hunan District before they were compelled to leave there some years ago on account of internal warfare. Among the relatives from Ohio at the reunion yesterday were the following: Mr. and Mrs. Oliver Hostetler and son, Mr. and Mrs. Nenno Nussbaum, Mr. and Mrs. Moses I. Miller, Wallace Miller, Mr. and Mrs. Hugo Miller, Harlan Miller, Mrs. Susan Miller, Miss Elettra Miller, Forrest Miller, Algie Bixler, Mr. and Mrs. Daniel Mutschelknaus, John Mutschelknaus, Mrs. Roy Farber, Harvey Armburst, Mr. and Mrs. Clarence Shepser, Mr. and Mrs. Edward Geib, George Weaver and Bryon Weller. 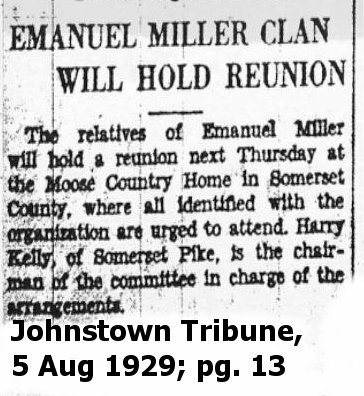 Other relatives in attendance included Mr. and Mrs. Harry Lehman and family, of Nant-y-Glo; Miss Edna Lehman and Miller and Charles Lehman, of Ebensburg, and Mrs. Algie Lehman, and children, Donald, Harry, Dorothy and John Lehman, of Kentucky. The Lehman children were born in China. These officers of the Miller association were re-elected: President, Levi Miller, of this city; Secretary, Miss Edna Lehman, of Ebensburg, and Treasurer, Newton Luther, of Richland Township. Annual Convention will Include Election of Officers for Coming Year. 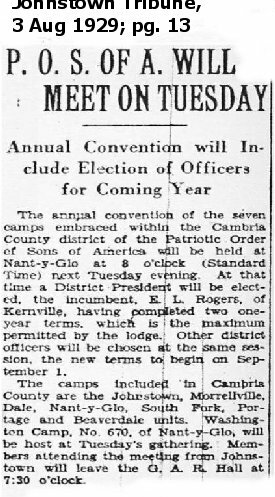 The annual convention of the seven camps embraced within the Cambria County district of the Patriotic Order of Sons of America will be held at Nant-y-Glo at 8 o'clock (Standard Time) next Tuesday evening. At that time a District President will be elected, the incumbent, E. L. Rogers, of Kernville, having completed two one-year terms, which is the maximum permitted by the lodge. Other district officers will be chosen at the same session, the new terms to begin on September 1. The camps included in Cambria County are the Johnstown, Morrellville, Dale, Nant-y-Glo, South Fork, Portage and Beaverdale units. Washington Camp, No. 670, of Nant-y-Glo, will be host at Tuesday's gathering. Members attending the meeting from Johnstown will leave the G. A. R. Hall at 7:30 o'clock. MISS ELLA KILCOIN, of Southmont, is home form a stay of a month or so in Cumberland and Bedford. MR. AND MRS. CHARLES SUDER, of Conemaugh, have returned from a week's visit to relatives in Pottstown and Lancaster. MISS HELEN TRENT, of 741 Coleman avenue, left today for a short visit with friends in DuBois and Luthersburg. MR. AND MRS. C. PAUL HEINZE, of Fronheiser streeet, will leave tomorrow night for Montreal and Quebec to spend their vaction (sic). MISS EVA BUCKEY, of the First ward, left Thursday evening for Osceola Mills, Clearfield County, to spend a short time with her parents. MR. AND MRS. M. C. WALKER, of Grant street, Turtle Creek, are spending two weeks in Johnstown, visiting Mrs. Walker's parents.-Braddock News-Herald. NELSON A OVERDORF, of the South Side, will leave this evening for Detroit, Mich., to visit his sons, Jay P. and Arthur Overdorf, former residents of this city. MASTER HENRY CARTIN, son of Dr. and Mrs. Harry Cartin, of Lincoln street, has returned from the State of Michigan, where he had been rusticating for some weeks. MRS. HENRY MULLER, of Somerset, is in Kernville on a visit to her brother-in-law and sister, Mr. and Mrs. C. W. Horrell, of 729 Napoleon street. She will remain a fortnignt or so. MISS RUTH E. MILLER and Jennie S. BOYER, of the Kunts apartments, Franklin street, have returned from a 10-day trip to Baltimore, Washington, Norfolk and Virginia Beach, Va.
MR. AND MRS. RUSSELL CRAIG and their two children, of Franklin County, are here to attend the funeral of Mrs. frank Craig, mother of the former, whose death occurred in Morrellville on Thursday. MR. AND MRS. O. F. LUTTRINGER, of Philadelphia, are week-end visitors with relatives and friends in this city and at Camp sunshine, Bedford County. They are former residents of Johnstown. DAVID T. EDWARDS, of first Ward, has returned from New England, where he had been on an overland tour in company with his son, Everett Edward, and family, of Washington, D. C.
MRS. CARRIE PARKER and Mrs. Catherine Gillingham, who had been â€¦. (next line missing)â€¦..of Westmont, have returned to their home in Germantown, Md. MR. AND MRS. EBEN EDWARDS and son, John Edwards, and Miss Irene MELINGER, of the Seventh Ward, are home from an automobile trip to the Dominion of Canada and the New England States. MRS. WILLIAM WYNN, of Bolivar, the guest of Mrs. James PIPER, of Walnut street, for the last week or so, returned home last night in company with her husband and daughter, who drove here for her. MR. AND MRS. BERT MILLER, of Portsmouth, O., and their son and daughter-in-law, Mr. and Mrs. Wilbur Miller, of Toledo, O., who had been visiting here and in Stoyestown for a fornight or so, have returned home. THE REV. DR. FRANKLIN E. HETRICK, of the Eighth Ward, who had been at arbutus Park for the last fortnight or so, left here tday (sic) for Westover, Clearfield County, to preach in the Evangelical Church there tomorrow. HON. ANDREW W. MELLON, U.S. Treasurer, is enjoying a well-earned vacation at the Rollin Rock Club, amidst the pretty scenery of that section of this valley. Mr. Mellon's son, Paul, is with his father.-Ligonier American. THE REV. DR. AND MRS. C. W. WINEY, of the Seventeenth Ward, who have been at Chautaqua Lake, N. Y., for the last few weeks, arrived home today, Dr. Winey to occupy his pulpit at the services in the Moxham Church tomorrow. MRS. PAUL BLAST and daughters, Emma and Martha, spent last Thursday with Mrs. M. J. Tondora, of Johnstown. MISS FANNIE COLEMAN, of Bryn Mawr, arrived in the city last evening to remain for several weeks with her parents, Mr. and Mrs. Ephraim Coleman, of Roxbury. Miss Coleman is a sister of the Rev. Boyd E. Coleman, pastor of the Bedford street Evangelical Church. MRS. C. A. MILLER, of Windber, returned home last evening from Bellefonte, where she had been for a fortnight or so with her brother-in-law and sister, attorney and Mrs. Arthur DALE. Thomas D. O'NEAL, of the First Ward, who had been on an outing in Centre County for a short time returned to the city several days ago. DR. CHARLES S. HENDRICKS is slowly recovering from a fracture of the hip sustained in a fall from a ladder three weeks ago. It is hoped that with the passing of another week he will be able to move about on crutches. Among recent visitors in his home at 610 Second street, east, Juniata, were Col. Edward M. Island, wife and daughter, Miss Edith Island, Coraopolis, who stopped to see Dr. Hendricks while en route home from the National guard encampment at Mr. Gretna. Col. Island is ranking officer of the 103d Medical regiment, in which Dr. Hendricks is a Major.-- Altoona Tribune. Hon. John H. McCann Is Victim of Hikers; Walks to Bedford to Report Theft. Tribune Bureau, Ebensburg, Aug. 3. While in Bedford County yesterday on a fishing expedition, Judge John H. McCann, of this place, had his automobile stolen by two youths hiking from Brooklyn, N. Y., to the Pacific Coast, and the jurist was forced to hike several miles into Bedford to report the theft to the police. The stolen automobile was recovered some time later by the police along the highway near Woodburry and Louis Caputo and Alfred Stali, alleged thieves, were placed under arrest and lodged in the county jail at Bedford. Judge McCann's car was slightly damaged when recovered, as the two youths had run the machine off the road into a ditch and struck a telephone pole. The jurist returned to Ebensburg last night. 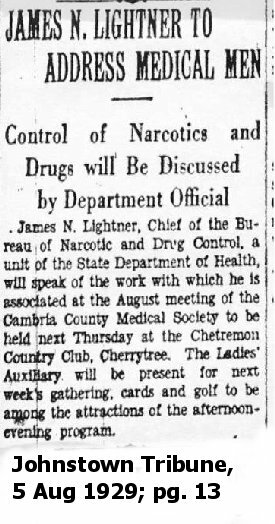 James N. Lightner, Chief of the Bureau of Narcotic and Drug Control, a unit of the State Department of health, will speak of the work with which he is associated at the august meeting of the Cambria County Medical Society to be held next Thursday at the Chetremon Country Club, Cherrytree. The Ladies' auxiliary will be present for next week's gathering, cards and golf to be among the attractions for the afternoon evening program. The relatives of Emanuel Miller will hold a reunion next Thursday at the Moose Country home in Somerset County, where all identified with the organization are urged to attend. Harry KELLY, of Somerset Pike, is the chairman of the committee in charge of the arrangements. Engine Company No. 5 extinguished a small blaze in a street car of the Johnstown Traction Company, on Fairfield avenue, at 3:50 p.m. yesterday, the blaze being due to a short circuit in wiring, it was reported. SOMERSET, Aug. 3,--At the regular meeting of the Alpha Bible Class of the United brethren Sabbath School, held Thursday evening at the home of Mrs. Maude KURTZ, of West Race street, Mrs. Naomi TRENT was re-elected teacher. Mrs. Trent has been the teacher of the class for the last 12 years. The class officers chosen to serve with Mrs. Trent are the following: President, Miss Mary WALTERS; Vice President, Mrs. McFarling; Secretary, Miss Margaret WSLTERS; Treasurer, Mrs. Charles PECK. After the business session a delightful luncheon was served. 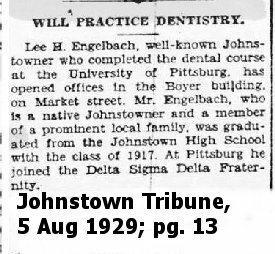 Lee H. ENGELBACH, well-known Johnstowner who completed the dental course at the University of Pittsburg, has opened offices in the Boyer building, on Market street. Mr. Engelbach, who is a native Johnstowner and a member of a prominent local family, was graduated from the Johnstown High School with the class of 19197. At Pittsburg he joined the delta Sigma Delta Fraternity. 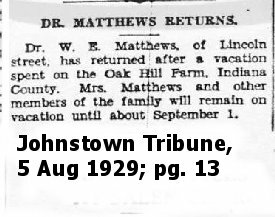 Dr. W. E. Matthews, of Lincoln street, has returned after a vacation spent on the Oak Hill Farm, Indiana County. Mrs. Matthews and other members of the family will remain on vacation until about September 1. WILKES-BARRE, Aug. 3.-In a fire which followed a slight explosion in the home and business place of Lewis ROBINSON, of Edwardsville, yesterday, Mr. Robinson, aged 55; his wife and daughter, Mrs. Harry MEYERS, as well as Mrs. Mary MARCHINICK were severely burned. All were removed to the Wilkes-Barre general Hospital. The parents and daughter are reported in a critical condition. Police are trying to determine the cause of the blast which occurred in the kitchen, where the household was assembled. PORTAGE, Aug. 24. -- Funeral services for Matt Keilmann, aged 24 years, whose death occurred Wednesday in Elizabeth, N.J. as the result of injuries received in a gas explosion, will be held at St. Mary's Catholic Church here at 2 o'clock tomorrow afternoon. Burial will be in the church cemetery. Undertaker Isadore Serenko will have charge of the funeral. The deceased is survived by his widow, Mrs. Mary Keilmann; his parents, Mr. and Mrs. Charles Keilmann of Revloc; his grandparents, Mr. and Mrs. Matt Lehs, of Portage, and the following brother and sisters: Carl, Vincent, Fred, Walter, Francis, Mary, Hilda and Olga Keilmann, all of Revloc. BARNESBORO, Aug. 24. -- Funeral services for Michael Shuma, aged, 62 years, of this place, who died yesterday afternoon at the County Home, Ebensburg, where he had been an inmate for the last year, will be held at 9 o'clock Monday morning in St. John's Greek Catholic Church. Burial will be in the church cemetery, in charge of Undertaker M. J. Bacha. The deceased is survived by his widow, Mrs. Barbara Shuma, and the following children: Mary, of Detroit; Mrs. R. E. Hollows, George Shuma, Mrs. D. H. Glass and Mrs. R. W. Reed, all of Altoona; Andrew and Michael, jr., at home. A brother, George Shuma, resides in Monessen. GEORGE GREGORY, jr., son of Mr. and Mrs. George Gregory, sr., of 920 First avenue, Westmont, has returned home from a monthâ€™s vacation in Cleveland, O.
MR. AND MRS. FRANK HESLOP and son Billy have returned to their home in Ambridge. They were guests of Mr. Heslopâ€™s brothers, Harry Heslop, and wife, of Sheridan street. AUGUST BEAS, Sr., and daughter Catherine, of 702 Broad street, have returned from a five weeksâ€™ trip to Cleveland, where they visited the john and Anthony Beas families. MR. AND MRS. EDWARD EICHLER and Mrs. and Mrs. Otto GIFFIN and son, all of Morrellville, left overland Saturday evening for Detroit, Mich., and Canada to visit among relatives. MR. AND MRS. JOHN FRIEDLINE, of Wood street; Mr. and Mrs. Wallace FRIEDLINE, of Listle;; Sarah Friedline, of Wood street, and Marvin MITCHELL, of Palliser street, have arrived home from a trip to Indianapolis, Detroit, Canada, Niagara Falls and Buffalo. MR AND MRS. EDGAR KURTZ and their three children, Elmer, Kathleen and Edward Kurtz, of Mt. Union, Huntingdon County, are in Brownstown borough as the guests of Miss Lela YEAGER, of 117 George street. MISSES L. HELEN AND BESS BERKEY, of 119 Main street, the former the librarian at Cambria Free Library, are expected to return home within the next few days from Frostburg, Md., where they have been with relatives since August 1. MRS. EMMA S. WHITE, of St. Petersburg, Fla., who is spending the summer here, has just returned from the Methodist campmeeting grounds at Ridgeview. She is now the guest of her nephews, Earl and Lee SPANGLER, of Sugar Hill Farm, Millcreek. MR. AND MRS. A. H. VARNER, Mrs. Daisy HERDMAN and Mrs. Harry BAKER, of this city, are home from a stay in Indiana County. They were among the many visitors at the recent reunion of the survivors of the Civil War of Indiana and surrounding counties. MISSES BARBARS AND ANNA STRIPPY, of Akron, O., have returned home after spending a week or so among relatives in Bon Air. They were called here to attend the funeral of their father. Miss Susan MAGERA, of this city, accompanied them to Akron. DENNY S. SHERIDAN, formerly of Gallitzin, but for the past eight years residing in Phoenix, Ariz., after visiting for a month at his home in this city, left by motor on the return trip yesterday morning. He was accompanied by Glenn J. HANLIN, of 2013 Fifth avenue.---Altoona Tribune. MRS. ALLEN FRASER, of Detroit, Mich., who had been visiting relatives in Cambria County for several weeks, left this morning for New Kensington, Pa., to visit other relatives before returning home. Mrs. Fraser is a sister of John D. WALKER, President of the Board of County Commissioners. MRS. MARY J. PORTERFIELD, of the beck apartments, South Side, returned home last night from Ashland, O., where she spent the past two months with relatives. Mrs. Porterfield came to the city by automobile with her uncle, J. C. ALLEN, of Ashland, who will remain here a week or so. THE REV. F. J. EGER, pastor of St. Josephâ€™s German Catholic Church, Braddock, returned home last evening after attending the funeral of the late Mrs. James MARSHALL, his relative. Father Eger was born and reared in the vicinity of Carrolltown. He is one of the oldest priests in the Diocese of Pittsburg. H. Stanley Pringle, of Fourth street, Conemaugh, who has been ill since August 3, is slowly improving at the Memorial Hospital, where he has been a patient since last Wednesday. Mr. Pringle is Assistant Secretary- Treasurer of the United States Saving & Trust Company. Bakersville, Oct. 8. -- John Kooser, aged 37 ears, died of a omplication of diseases at 2:30 o'clock yesterday afternoon at his residence here. The deceased is survived by his widow, Mrs. Gertrude (Bell) Kooser; five sons and one daughter. He also leaves his mother, Mrs. Noah Brunner, of Rockwood, and two brothers, Samuel Kooser, of Somerset, and David Kooser, of Johnstown. Funeral services will be held Thursday afternoon, the cortege leaving the Kooser home at 2 o'clock and going to the local Lutheran Church. Services will be conducted in the church at 3 o'clock by the Rev. R. M. Petrea, pastor. Interment will be in the church cemetery. Undertakers Brooks and Hauger, of Somerset, will have charge of the funeral. Mrs. Clara Paul, aged 66 years, a native of jackson Township, died Friday of heart trouble, at her home, 2945 Hamilton Terrace, Detroit, Mich., where she resides the last few years. Her body arrived in Johnstown at noon Saturday and was conveyed to the home of her son, William Paul, of Carnbrook, where services were conducted Sunday at 2:30 p.m., with burial in the Cairnbrook Cemetery. Her husband and a daughter preceded her to the grave. Mrs. Paul is survived by the following children: Edward Paul, Turtle Creek; Daniel Paul, Rockwood; Mrs. Joseph Gordon, Cairnbrook; William Paul, Cairnbrook; Mrs. Cle_e Saylor, Berlin; Frank, Allen and Maurier, at home. Twenty-one grandchild and one grat-grandchild also survive. Berin, Dec. 13. -- Jeremiah Rufus Landis, aged 56 years, of this place, died about 10:30 o'clock last night at the Wenzel Hospital, Meyersdale, where he underwent an operation yesterday for an obstruction of the bowels. The deceased was born in Brothersvalley Township, near Berlin, on June 3, 1873. He was a son of Mr. and Mrs. Joel Landis. His mother passed away about four months ago. He is survived by his father, his widow, Mrs. Lillie Landis, and these children: Mrs. Henry Shockey, of Berlin; Osborne Landis, at home, and Mrs. Robert Ringler, of MacDonaldton. Mr. Landis also leaves several brothers and sisters. the body was turned over to Undertaker J. N. Johnson to prepare for burial and was brought to Berlin this morning. Arrangements for the funeral services have not yet been completed. Interment will be in the local Odd Fellows' Cemetery. Stoyestown, Dec. 13. -- The Ladies' Aid Society, of Mt. Tabor Reformed Church, held its regular meeting recently at the home of Mr. and Mrs. J. Z. Rhodes, of this place. A roast venison dinner was served by the hostell. Two quilts were made by the members during the day. Those present were: Mrs. Penrod, of Lorain, O.; Jonathan Rhodes, Mr. and Mrs. J. Z. Rhodes, Mr. and Mrs. I. D. Buechley, Mrs. Royal Shaffer, Mrs. Calvin Sechler, Mrs. Fae Sechler, Mrs. Charles Mull, Mrs. Lloyd Mull, Mrs. Waldo Buechley, Mrs. James Winters, Franklyn Mull and Carol Winters. At the December meeting of the members of Johnstown Chapter, American War Mothers, at the American Legion Home, 114 Main street, yesterday these officers were elected to serve to the next two years: President, Mrs. W. A. Auchinvole, re-elected; First Vice President, Mrs. Alfred Slater; Second Vice President, Mrs. Sara Bee; Third Vice President, Mrs. Carl Resley; Fourth Fice President, Mrs. W. E. Keedy; Chaplain, Mrs. Archie Bruce; Recording Secretary, Mrs. Margaret Wagner; Treasurer, Mrs. J. L. Weimer; Auditor, Mrs. Carrie Taylor; Custodian of Records, Mrs. C. E. Walker; Historian, Mrs. Alice Martin, and Sergeant of Arms, Mrs. Frank Seigh. Mrs. G. A. Howell and Mrs. D. C. Sutton, both of Altoona, were present as guests of the Chapter. Mrs. Howell is the State President and First Vice President of the National Chapter, American War Mothers, and Mrs. Sutton is the State Corresponding Secretary of the society. Following the election of the officers were installed by Mrs. Howell, after which she spoke to the local women on the plans for Christmas activities in behalf of war veterans in Government hospitals. The local chapter was assigned 45 young men in western hospitals to whom to send Christmas greetings. Aside from the State work the local women plan to take care of several needy families during the Christmas season. Following the meeting the members of the society, 12 in number, and the visiting officers from Altoona took dinner at the Legion Home, where the Mercy Hospital Guild served a sauerkraut dinner. Organized less than a year ago the local chapter of War Mothers has accomplished some excellent work in the interest of World War veterans and is rapidly becoming an influential organization. Date Created: 18 Mar 2004.